Few things keep us grounded in style quite like our flooring. But just like apparel, there are yeas and nays to every choice. Here is what you need to know before installing wood flooring in your home. Solid hardwood flooring is exactly that – flooring made up of planks of solid wood ranging in thickness from 3/4” to 5/16”. Solid hardwood flooring is is the standard all other flooring options are compared to and typically costs around $11.00 – $23.00 per square foot to professionally install (incidentally, Red Oak is usually the cheapest solid hardwood flooring you can buy while American and Brazilian Cherry are the most expensive). Solid hardwood flooring comes in some 50 species of wood, looks gorgeous, sounds beautiful (don’t be scared, we mean when you walk on it) and never goes out of style. Its thickness allows it to be sanded and refinished (and recolored) many times meaning it can last for generations and day-to-day maintenance is easy. Oh, and its good to the environment in more ways than one. Its not suitable for basements or humid environments and given you can't install it easily and need lots of special tools to do so (oh and you cant afford to get it wrong like you can with say tile or paint) you really need to hire a professional. If you want it installed and in-use faster, you’re best having it “finished” in the factory. Made of actual wood, engineered hardwood floors are manufactured with several layers of different wood veneers. The sub layers can be of the same or different species with the grain of each running in different directions. Engineered hardwood is more stable than solid hardwood flooring and less prone to change with temperature and humidity. It too looks and sounds great but the big plus is that it can go where solid wood floors cannot - humid environments, basements, even directly over concrete. Engineered hardwood flooring is typically 10-15% more expensive to install than solid wood flooring. Unlike solid wood floors which can last for generations however, an engineered wood floor has a lifespan of just 15-20 years. Also, you can only resurface them once at best and cannot recolor them at all. Porcelain tiles are ceramic tiles fired at a higher temperature and commonly used to cover floors and walls due to their low water absorption rates. Just like donuts, they come in glazed and unglazed varieties. They can also be made to look exactly like wood (see...). Porcelain tiles are resistant to staining, easy to clean, and highly durable. They never need to be refinished and can last for decades. They're perfect for basements, bathrooms and laundry rooms and are a better fit for heated floors than solid or engineered wood flooring. They are also cheaper to install than solid or engineered wood. More so than any other flooring, porcelain tile installation has to be spot-on because imperfections are very visible. 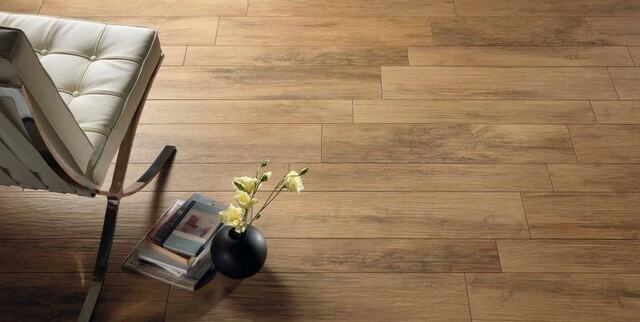 Laminate vinyl is the magician of wood flooring - things are not what they seem. Not to be confused with engineered hardwood, laminate vinyl wood flooring is not wood at all, but rather a photo of wood stuck (laminated) onto an underlying surface. It’s cheap. At as low as $0.50 a square foot, the price-point is unbeatable. Its water resistant, making it perfect for humid environments like bathrooms and laundry rooms and installation can be done without professionals. In fact, on a scale of difficulty to install, its somewhere between applying a stamp and adding a transparent protective layer to your iPhone. No matter how well installed, laminate vinyl looks and sounds inexpensive and is best installed in areas of your house where visitors are sparse (like an underfloor cupboard).